Anthroenology is involved in two different wine events this October. 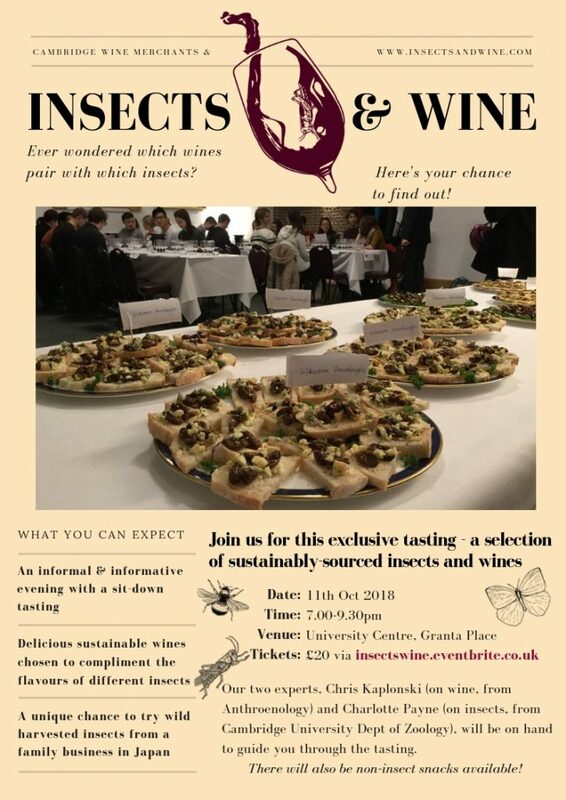 In the first, The Less Sociable Half will be doing an Insects & Wine evening with Charlotte Payne, hosted by Cambridge Wine Merchants. You can order tickets here on Eventbrite here. Later in October (the 26th, to be precise) both halves of Anthroenology will be at a natural wine tasting at 169West in Zurich. This is being hosted by an Cambridge and Oxford alumni club, so apparently you need to be in the know to wrangle an invite. Our topic: ‘What do reincarnation, cow horns, and wild yeast have in common, and what can they teach us about wine?’ Or, in other words, why is anthropology useful for thinking about wine? Finally, a quick note. It’s been a while since I’ve posted here. I’m not apologising for that. Julia and I are both clear that we want to keep this blog as about the project, and related topics. In other words, we don’t want to turn it into yet another wine blog, reviewing wines or the latest vintage. However, please do get in touch if there are topics you’d like to see covered. We’d be happy to hear from you!